DUBAI // Investors in one of Palm Jumeirah’s biggest developments say they have been left out in the cold by a Dh1 billion (US$272.3 million) legal dispute between Souq Residences, the company behind the project and Nakheel, which built the group of islands. The investors in the Golden Mile who recently formed a group to advocate for their interests say they have yet to move in six years after the project’s launch, even though construction has been completed and they have paid in full for their properties. A property owner in Nakheel’s Jumeirah Islands development has won a Dh2.5 million (US$680,624) cash payout from the developer, the first such award from the Dubai World Tribunal. It was also the first time the Tribunal enforced an arbitration decision from another court, which could set a precedent for other disputes involving the developer. The Dubai International Arbitration Centre last May ruled that Vinod Kumar Dang should be paid Dh2.5m plus interest and legal costs in a row over construction defects in a villa. 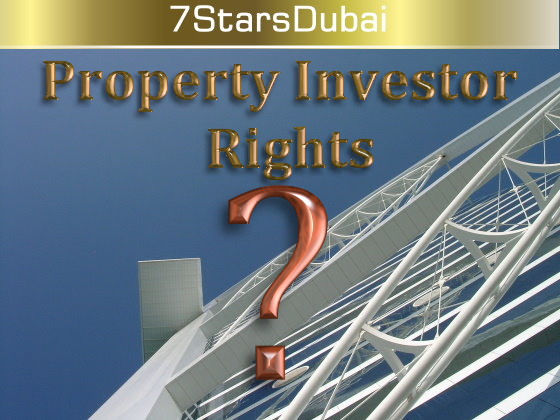 The property owner then took the matter before the Tribunal to have the award verified and paid out. The Tribunal is a special body hearing all cases relating to Dubai World, the government-owned business group that is finalising a $24.9 billion debt restructuring. 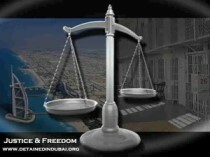 Nakheel, which built Jumeirah Islands, is owned by Dubai World. Lawyers for Jumeirah Islands had argued that the arbitration award should be struck out, claiming there were technical faults in the language of the judgment. Mr Dang’s lawyers countered that the award was made legitimately in arbitration and that it was the role of the Tribunal to enforce such judgments. 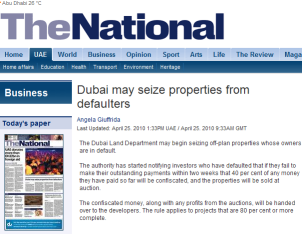 The Dubai Land Department may begin seizing off-plan properties whose owners are in default. The authority has started notifying investors who have defaulted that if they fail to make their outstanding payments within two weeks that 40 per cent of any money they have paid so far will be confiscated, and the properties will be sold at auction. The confiscated money, along with any profits from the auctions, will be handed over to the developers. The rule applies to projects that are 80 per cent or more complete. The move, according to Mohammed Sultan Thani, the department’s assistant director general, is intended to spur the completion of unfinished projects. “The idea is to see what we can do before the property is cancelled,” he said. During the property boom, many developers depended on the off-plan model, whereby a property is sold before building work starts to provide finance for construction. Many analysts say the model fuels speculative buying and inflates prices. A number of developers, including Kuwait’s Al Mazaya Real Estate, which has eight projects in Dubai, have had such cancellation notices issued to investors. Omar Ramaznouf, a Russian investor who has so far paid Dh10 million (US$2.7m), 60 per cent of the total price, towards 16 office units at Mazaya Business Tower in Jumeirah Lake Towers, recently received one of the Land Department’s notices. Mr Ramaznouf, who has not made any payments on his development since December 2008, was told in the letter that the developer would be allowed to “sell the related unit[s] by auction in conformity with common regulations, and with the price asked for by the developer in addition to expenses”, unless he paid the next 20 per cent instalment within two weeks. The final instalment is due when the properties are handed over. Mr Ramaznouf said he has been unable to pay some instalments because of “cash-flow problems” brought on by the financial crisis. He has been trying to extend his payment plan with Al Mazaya, according to Medhi Guliyev, his business partner. “But now he’s being told ‘you don’t own this property anymore,’” said Mr Guliyev. George Ezman, a businessman from the Czech Republic who bought several office units in Jumeirah Business Centre 5, a project by the Dubai developer Al Fajer Properties, has received a similar notice. He has paid 30 per cent of the total cost and is due to pay the remainder on completion. Mr Ezman complained, however, that the developer breached its agreement by delivering the property more than a year late. He said that, according to his contract, he had the right to cancel the contract and receive a refund if the property was late. Spokesmen for Al Mazaya and Al Fajer were unavailable for comment yesterday. Lawyers working for investors such as Mr Ezman say that while the Land Department can issue cancellation notices, a property agreement can only be officially cancelled by the courts.